Denying access to health care as a tool of war is illegal according to international law, yet it has become a hallmark of the Syrian crisis. In 2017, the people of Syria faced continued attacks on healthcare and civilian infrastructure, leading to loss of life, loss of access to healthcare, and attrition of skilled health care workers. The ongoing conflict in Syria, coupled with the systematic targeting of healthcare, have left millions of Syrians with little to no access to humanitarian aid. 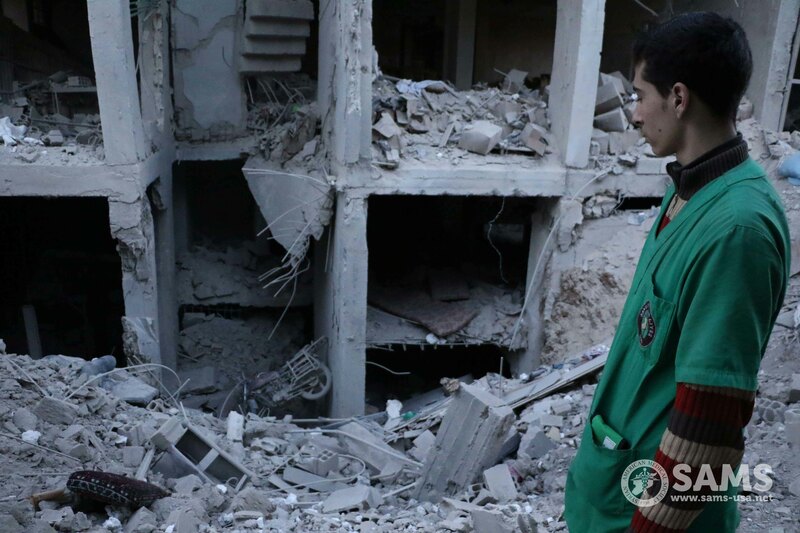 Medical workers in Syria continue to risk their lives to save others, and have faced tremendous loss. In 2017, SAMS witnessed sustained periods of attacks on facilities, including in April, when SAMS recorded an escalated rate of 24 attacks on healthcare throughout the month. In 2017, SAMS documented the death of 21 medical personnel in attacks on healthcare, as well as 4 administrative personnel working in medical facilities. SAMS also documented the permanent or temporary closure of 41 health facilities in 2017 — ranging from reproductive and pediatric health centers to hospitals and medical points—due to damage wrought by weapons including airstrikes, chemical attacks, artillery shelling, barrel bombs, and air-to- surface missiles. The illegal use of chemical weapons also continued in 2017, with 29 chemical attacks recorded by SAMS in 2016 and 2017 (14 attacks in 2017). On April 4, 2017, Syrians experienced the deadliest chemical attack since the 2013 sarin gas attack on East Ghouta, when Khan Sheikhoun was attacked with sarin gas, killing at least 104 people. 2017 drew to a close amidst an alarming escalation of hostilities in the besieged area of East Ghouta, and the province of Idlib. East Ghouta, which was subject to a stifling blockade for over five years.